A Center For Grieving Children is a support center for children who are grieving the loss of someone they love because of divorce or separation in the family or because of the death of a loved one. We also have support groups for children in foster care. The Center is the primary program of the Family Summit Foundation. It is a non-profit organization that serves nearly 800 individuals a year. There is no cost to the families that use our services. We are funded through foundations, organizations and private individuals; we do not receive government funding. Within each of us is the natural capacity to heal ourselves. The length and intensity of grief is unique to each individual. Acceptance and caring assist in the healing process. To heal, the bereaved child must be not just allowed, but encouraged to embrace the wide range of thoughts and feelings that result from the loss. Our groups provide an environment in which bereaved children can safely mourn, and where they are allowed to explore thoughts and feelings about their loss in a way that helps them be compassionate with themselves and others. 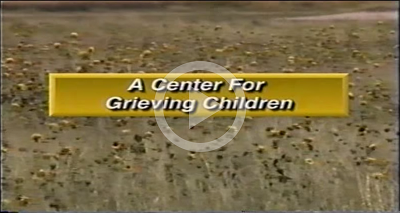 A Center For Grieving Children offers mutual support and acceptance through listening and sharing. We respect each individual family's belief system. Our goals are to support and nurture children and their families in a loving and understanding environment as they experience grief. We hold workshops and give presentations to provide education and training on grief and the grief process for community agencies, schools and families. We provide crisis intervention and consultations to schools. We have a library, with materials and books available to the public. Groups are available for Youth (ages 3-12) and Teens (13-19) that are grieving due to the death of a loved one, a divorce or separation, and also for children in foster care. A typical group includes up to 10 children, 5 trained volunteer facilitators and staff. An adult family member or care-giver must accompany a child and may participate in the adult support group which meets simultaneously.